FOOTBALL: Sunderland manager David Moyes said he "felt for the supporters" after the Black Cats' 10-year stay in the English Premier League ended. 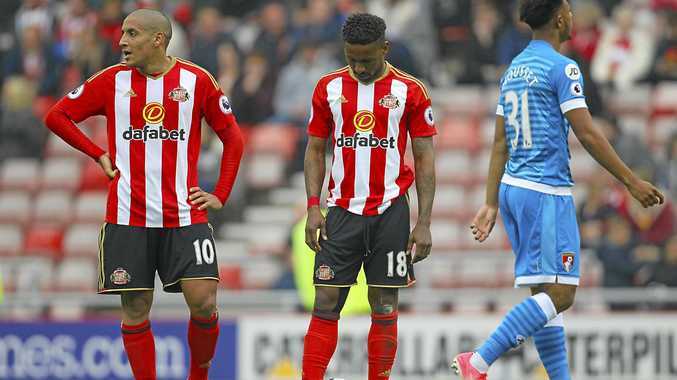 They were relegated after a 1-0 home defeat to Bournemouth and Hull's 0-0 draw at Southampton. Sunderland looked like getting a stay of exceution when Southampton was awarded an injury-time penalty against Hull but Eldin Jakupovic dived low to save Dusan Tadic's spot kick to leave Moyes' team 13 points off safety with only 12 points left available. Bournemouth broe Sunderland fans' hearts with an 88th-minute winner from Josh King after a swift counter-attack. "My feeling at the start of the season was it was going to be a hard graft," Moyes told BBC Radio. "But ultimately today I feel for the supporters. "They pay their hard-earned cash to come to the stadium and we have not given them enough this season. Moyes said he was not ready to discuss his future. The club's American owner Ellis Short issued a statement admitting the club had made mistakes and that a plan is in place to put things right. "I acknowledge that during my ownership mistakes have been made, particularly in the area of player recruitment, and as a result we have found ourselves struggling to survive in recent seasons," he said. "We had massive disruption during the summer transfer window and an unprecedented number of injuries throughout the season. "These are difficulties which we have been unable to overcome and we are paying the price for that now. "We need to improve, both on and off the field, and despite the bitter disappointment of today there is a strong determination to do so throughout the club. "There is significant work to be done over the summer and when the season is concluded, we intend to share our plans to move forward with our supporters." Burnley, meanwhile, boosted its survival bid with a first away win of the season after 18 attempts. The Clarets won 2-0 at Crystal Palace to move eight points clear of the bottom three. At the Hawthorns Jamie Vardy struck the 43rd-minute winner for champions Leicester against West Brom in a 1-0 win. Stoke City and West Ham played out a 0-0 draw.